It hasn’t exactly been a blazing summer, but this sunflower doesn’t seem to have noticed. It has shot up to a height of 23ft despite a distinct lack of the sunshine on which its species famously thrives and without any special treatment. With no sign of it slowing down, the giant bloom could soon break the world record height for a sunflower of 26ft 4in. 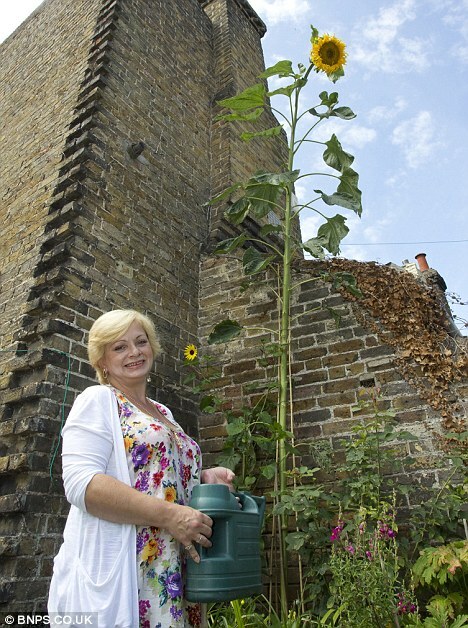 The sunflower towers over the back garden of Eve Fielding who expected it to grow no bigger than the 12ft her other efforts have tended to reach over the years. When it passed that mark and kept going the 48-year-old grandmother, who is herself only 5ft 2in, nicknamed it the Eiffel Flower. 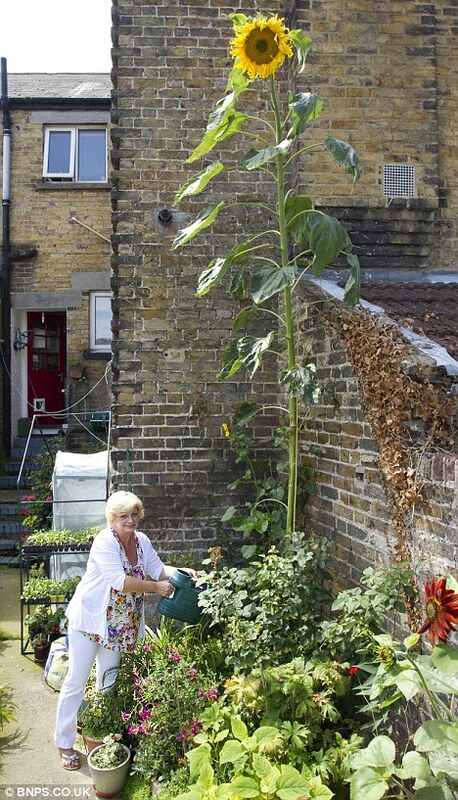 Mrs Fielding from Margate, Kent, had sown a handful of sunflower seeds as part of a light-hearted competition with her four-year-old granddaughter, and planted this one as a spare. She said she has watered it every day, but cannot explain why it has outgrown her other plants. Mrs Fielding said: ‘It’s enormous – I really can’t believe it’s grown this tall. I planted a few seeds with my granddaughter so we could have a race to grow the biggest one. 'This was one of the leftover ones so I thought I might as well sow it and see what happened. ‘I watered it every day, but I didn’t put anything special in the soil or anything daft and it just carried on growing. This is by far the biggest sunflower I’ve ever had – usually they’re around 12ft. 'My neighbours and visitors have all been quite surprised and shocked at the size. They think it’s a beast. According to Guinness World Records, the tallest sunflower to date measured 26ft 4in on August 17, 2009, and was grown by Hans-Peter Schiffer in Kaarst-Voorst, Germany.